Editor’s Note: We conclude our series on Multiple Myeloma with a profile of a patient who was struggling to afford her treatments until she received a grant from our sponsor, the HealthWell Foundation. The searing back pain was the first indication to Marilyn Gould that something wasn’t quite right. The 67-year-old retired architect from Baltimore started to feel the pain at age 62 and began visiting a variety of doctors and specialists to find out what was wrong. Blood work indicated high protein levels — a potential marker for multiple myeloma. Imaging did not reveal any tumors. Eventually, her L5 vertebra cracked and she had to have surgery. It was during this surgery that a tumor was discovered inside her vertebra. Two surgeries were needed to remove the tumor and replaced it with a titanium cage. “At that point, there was no question: I had multiple myeloma,” said Marilyn. 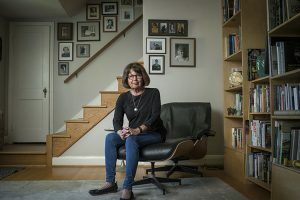 Marilyn’s hematologist suggested that she consult with a multiple myeloma specialist, who started her on a course of treatment that involves an oral chemotherapy medication, steroids, an antibiotic and four 30-minute bone infusions a year — a regimen she has followed for the last 5 years. As can happen with many chronic and life-altering diseases, multiple myeloma and its related treatments have had an impact on Marilyn’s lifestyle, though she says she still remains fairly active. The disease and its treatments have also had an impact on Marilyn’s financial security. Marilyn said that financial assistance for treatment copays is a common topic when she speaks with other multiple myeloma patients as part of her volunteer outreach work with the Leukemia & Lymphoma Society. While Marilyn is quick to point out that she is not a medical professional and can’t give medical advice, she does have words of wisdom to share with other multiple myeloma patients. The HealthWell Foundation, sponsor of Real World Health Care, is proud to have supported the multiple myeloma patient community in recent years with copayment and premium assistance. We have helped more than 9,000 multiple myeloma patients afford their treatments since 2015 — thanks to the generous support of our donors. Due to high patient volume, our multiple myeloma fund is temporarily closed until we receive additional funding. We invite corporations and individuals to help us meet this demand by contributing to our Multiple Myeloma Medicare Access Fund, so no one goes without essential medications because they cannot afford them.